Quote : "No, really... I think you'll like this one!" "I love my homeland as much as anyone else," Sinsi says earnestly, "but you have to admit; sometimes, things can get a little dull around Meridell. I mean, you can only count potatoes or play Cheeseroller so many times. Myself, I've never been one to just sit around bored; that's why, for as long as I can remember, I've always stayed busy by creating games for me and my friends to play." Giving a slight chuckle, the restless young Ixi concedes, "Granted, they can't all be winners. Every once in awhile, though, I manage to stumble upon something REALLY good..."
I was so wrapped up in what I was doing, that I hardly noticed my friends as they came walking up. "Hey Sinsi," one of them said, "it's been ages since you came up with anything new. You must be working on something really special, huh?" "Well," I replied, "there is this puzzle game that I've been working on lately. It's really quite a challenge, so I think you're gonna like it. I've still got a few things to work out here and there, but otherwise I think it's mostly ready. Would you like to give it a crack?" "Sure," one of them said, "how do you play?" "Sinsi!" one of my friends shouted. "I can't believe you talked me into playing this blasted game; I've been at it for hours now, and despite having a terrible headache, I just can't get myself to quit! I keep saying to myself, 'okay, this is my last try,' and yet, here I am... still playing!!!" Within days, word of Sinsi's new game (which she'd chosen to name Shapeshifter) had spread throughout Meridell. Soon, everyone was rushing to solve her perplexing puzzles. 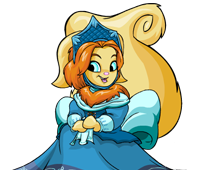 Now that her homeland has been discovered, Sinsi's baffling brainteasers have made her famous throughout all of Neopia.